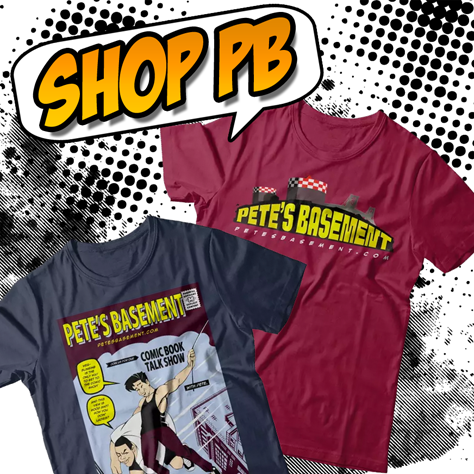 The Pete's Basement Show is BACK! Bigger, badder, and drunker than ever! Catch up with Pete and the rest of the Basement Crew as they go over what books have kept them entertained over the course of the last month. Eric Powell's Hillbilly is at the top of Pete's "You Need To Read This" List. Punisher is as Max as Marvel can get! DC Rebirth's Green Arrow, Flash, and Wonder Woman are pretty popular with Rich and Trish, while Greg has chosen to backtrack through the pages of some Marvel team graphic novels. Vampire Hunter D Interview with Stranger Comics' Josh Cozine - Pete's Basement @ NYCC 2016! Pete's in the Stranger Comics booth talking with Josh Cozine about one of his favorite anime and manga characters, Vampire Hunter D! After an enormously successful Kickstarter campaign, D is poised to star in his very first western comic book adventure, A Message From Mars! The insane finale!! Its part 3 of the mega-sized Episode 39 with Rocket Scientist Chris, Ninja John, Ramon, and Pete at the roundtable! ~~ Rocket scientist Chris Craddock and ninjutsu master John Maguire sit in at the comic book round table. Everyone's excited for Deadpool. We have fresh rumors about who Zoom is on Flash. Pete is enjoying Supergirl. Ash vs Evil Dead is awesome!